Gluten-free food is expensive. We all know that. It also doesn't help that most gluten free baked goods are best developed as mini versions of their gluten counterparts.This is where Gluten Free Coupons Canada comes in. I cannot begin to express how wonderful it is to see coupons for gluten-free products, available to Canadians! It's a big move forward seeing as most coupons, in general, are strictly available to our American friends. 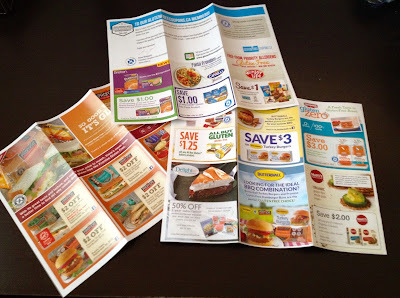 Gluten Free Coupons Canada sends out two coupon mailings a year. All you need to do is sign up here and you will be added to the coupon mailing list. Once signed up, you will automatically be on the list for future coupon mailings. Pretty awesome, right? Well, it gets better! When used, each coupon provides financial support to the Canadian Celiac Association. It's a win-win situation. I received coupons for a pretty good variety of items. Check out what I got in the mail, below. Overall, I feel that I received a great selection of coupons. While I have been a long time purchaser of most of the products, there were two which were new to me. These are the Butterball Turkey Burgers and the Breton products. I'm going to have to look for these on my next grocery run. It's a lot easier (and more exciting) to chance unknown territory and purchase a different product when you have a coupon for it! My favourite coupon would have to be the 50% off a 1- year subscription to Delight Gluten-Free Magazine!!! Holy crow that is an awesome deal and a big surprise! The coupons received will vary slightly, depending on where you live in Canada. Why? Well, some items are regionally based and thus not available across the country. The availability of particular coupons also depend on numerous other things, so please don't fret if you don't land a specific one. Promise Gluten Free - Can I please recommend the Double Chocolate Muffins?! If chocolate is not your thing, no worries. Promise Gluten Free offers a variety of gluten-free goods ranging from various breads, and rolls to muffins, english muffins, and even pancakes. Catelli Gluten Free - I'm already a huge fan of Catelli Gluten Free pasta! It cooks up perfect in under 10 minutes. It also reheats nicely, without falling apart. Dempster's Gluten Zero - This gluten-free bread is available in both white and whole grain. One of a handful of gluten-free bread's, that I enjoy this product has a nice sweetness to it. Breton Gluten Free - I have not tried this product yet. Various Cracker and Popped Bean snacks are available. 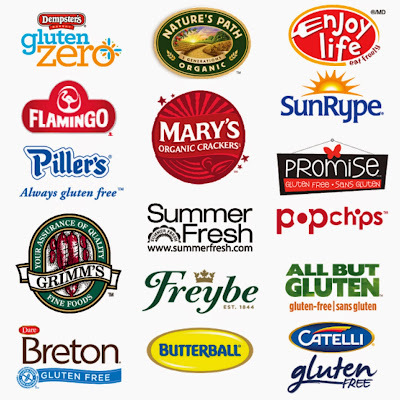 All But Gluten - Some really great products come from this company! My personal favourites include the Chocolate Snack Cakes, Chocolate Chip Granola Bars and the amazing white hamburger buns. You will not be disappointed. Flamingo - This brand is based out of Quebec and offers up three of gluten-free breaded chicken products: fillets, strips and burgers. Enjoy Life - Enjoy Life is one of my go-to favourite brands! They provide a large roster of items. All of which are wheat, dairy, peanuts, tree nuts, egg, soy, fish and shellfish free. Mary's Organic Crackers - I have tried the crackers which are lovely with a cheese spread. Did you know that you can also buy Cocoa MiNis, Chocolate Chip Cookies and Chipotle Tomato Pretzels from this company? I sure didn't and will now be on the look out for them. Butterball - I had no idea until I got my coupon that Butterball sells gluten-free turkey burgers. Boxes are clearly labeled gluten-free and these lean burgers can be cooked either by skillet or bbq. Nature's Path Organic - This brand offers many gluten-free options. They range from cereal and frozen waffles to crispy rice bars and superfood snack bars. Pop Chips - These are a great alternative to potato chips. Pop Chips are not fried. Instead, they are heated in a pressurized chamber and then quickly released. This results in a POP. Freybe - Freybe offers a wide range of meat products that are both lactose-free and gluten-free, with no liquid smoke or mechanically separated meat. Summer Fresh - Summer Fresh has over 25 gluten-free products available. This includes Tzatziki Dip, Artichoke & Asiago Dip Bruschetta, Crab & 4 Cheese Dip and Spinach & Artichoke Dip. Grimm's Fine Foods - This company has a lot to offer gluten-free consumers. Products include Gluten-Free Tortillas, Smoked Turkey Breast, Black Forest Ham, Honey & Maple Flavour Ham, Pastrami and more! SunRype - SunRype provides gluten-free fruit and vegetable juices along with various 100% fruit snacks. Piller's - This is a great choice. Piller's offer a wide array of gluten-free meat products through their Simply Free line. Which coupons did you receive? Was there a particular coupon that was your favourite? What brands/coupons would you like to see offered in future mailings?